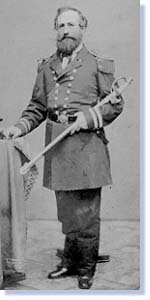 Captain Henry S. Stellwagen near the end of his career. There had been some knowledge of the area. Fishermen had called it Middle Ground for years. Some charts had noted shallows in the area. 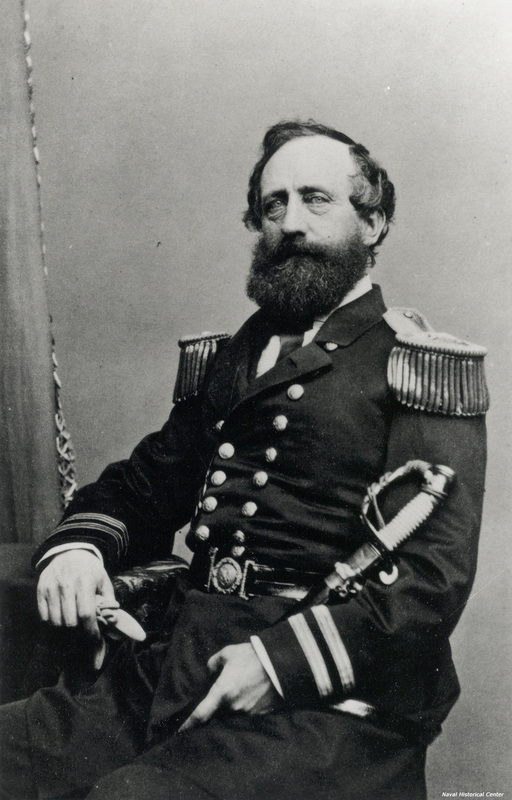 But it took Henry Stellwagen, a Lieutenant Commander of the U.S. Navy on loan to the U.S. Coast Survey (the forerunner to NOAA's Coast and Geodetic Survey) working from the US Coast Survey Steamer BIBB, to actually map the full length and breadth of the bank in 1854 and 1855. He wrote on October 22, 1854: "I consider I have made an important discovery in the location of a 15 fathom bank lying in a line between Cape Cod and Cape Ann -- with 40 and 50 fathoms inside and to northward of it and 35 fathoms just outside it. It is not on any chart I have been able to procure. We have traced nearly five miles in width and over six miles in length, it no doubt extending much further." The importance of this discovery was not lost on Alexander Bache, the superintendent of the Coast Survey, who noted in the 1854 annual report that: "The hydrographer in Massachusetts Bay had been rewarded for his labors by the discovery in the entrance of an extensive bank, of which he had given the position and defined the limits, with from ten and a half to fourteen and a half fathoms on it, lying across the entrance, and serving thus as an excellent mark for navigators entering this important bay. I propose to call this, from the name if its discoverer, Stellwagen's Bank." Accompanying Henry Stellwagen on his surveying vessel were two other individuals of note -- an amateur surveyor by the name of Alexander Wadsworth Longfellow, brother of the famous poet, and a fellow hydrographer, Edward Cordell. 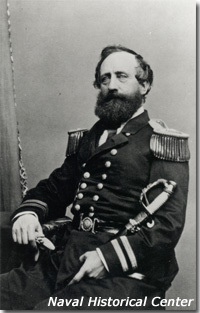 In 1869, Cordell, now in charge of his own survey ship, discovered a similar-sized bank on the west coast, which would eventually be named after him. Today, both Cordell and Stellwagen Banks are among the significant marine areas designated as National Marine Sanctuaries. According to Stellwagen, "I consider promulgation of this discovery as very essential to navigators, and that the knowledge of it will highly benefit commanders of vessels bound in during thick weather, by day or night. By it they can not only ascertain their distance to the eastward of the coast, but, by attention to the lead after passing inside, a good idea of latitude may also be obtained." This military man with a talent for hydrography was also an inventor -- he developed a sounding device with a steel cup covered by leather valves that could bring up specimens of the sea bottom. Used for many years by the Coast Survey, the invention won for him the Scott Premium Medal from the Franklin Institute. 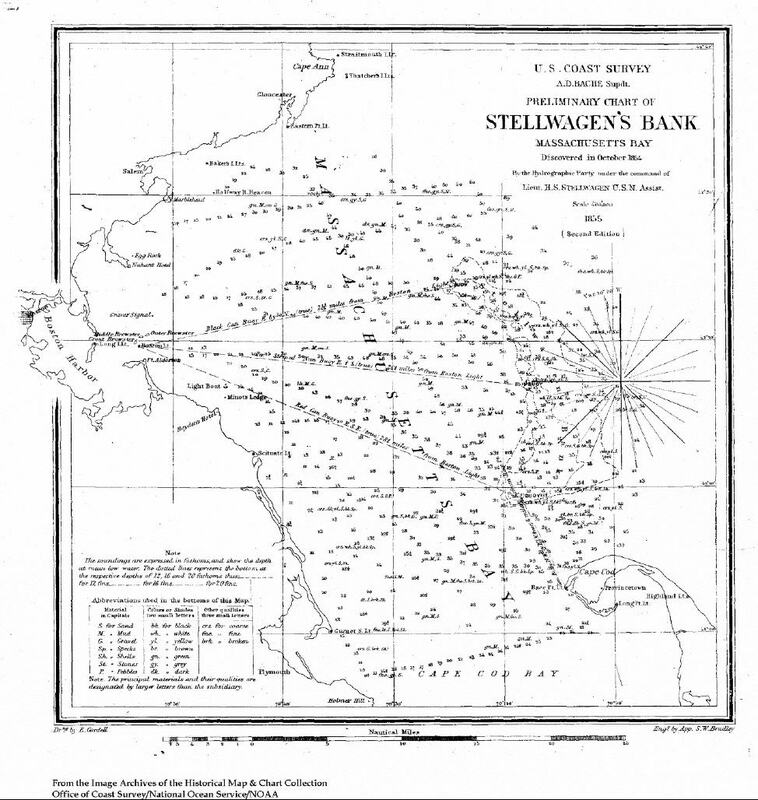 With his sounding device, Stellwagen not only measured the size of the bank, but the type of sediment on and around it. Said he, "The northern end of the bank has rocky bottom, with, however, a slight covering of fine black sand. The middle and southern parts are coarse white and yellow sand. The bottom inside of the bank, in deep water is generally a green unctuous mud, or ooze." Today, we are fine tuning those observations with a detailed survey of the seafloor in the sanctuary. New multi-beam side scan sonar survey systems allow scientists to not only get a precise reading of topography (depth), but backscatter of the sound source provides information on the types of sediments. 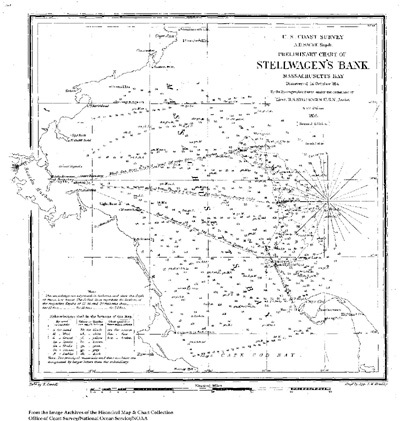 Stellwagen's preliminary map for the newly discovered bank in Massachusetts Bay. 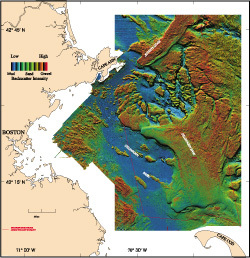 Map courtesy of NOAA Coast Survey.